charcuterie boards have become a staple at chez de shea. whenever we have company or decide to have a romantic evening at home, you bet there will be one heck of a spread. 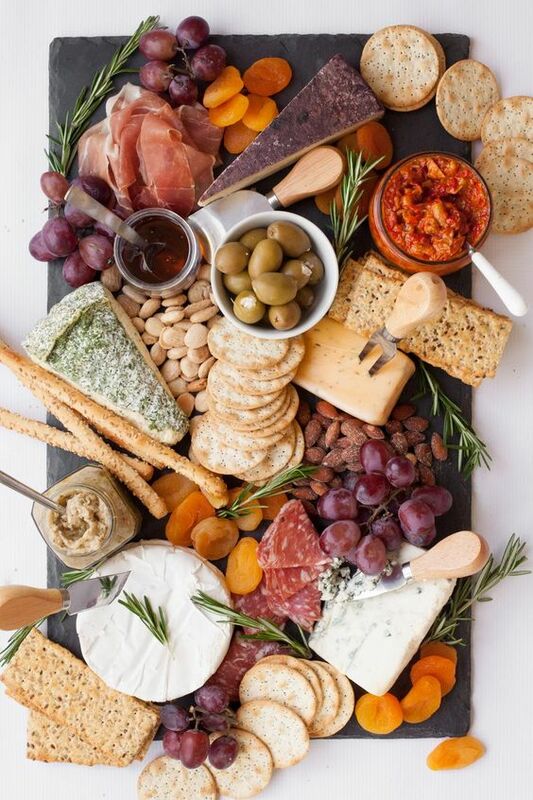 we love putting together a medley of different cheeses, meats, spreads, breads, crackers, honey, nuts, veggies, fresh seasonal fruits and dried fruits. after years of many nights at home and company coming over, we like to think we've perfected our strategy, and it's sort of become an art form for us. from the board it sits on, to the selection of each ingredient, we carefully construct our board layer by layer. Homenature always has a way to make the ordinary look extraordinary. This teak cutting board is one of those moments! This one is great for any season and can definitely hold a heavy load with it's massive size. Brooklyn Slate Company knows how to rock the charcuterie train like it's nobodies business. They have an asbolutely beautiful assortment of slate in different shapes and sizes! We love this live edge walnut board from Farmhouse Pottery. It has so much depth and character, and the richness of the wood definitely compliments those light-colored cheeses and dark-pigmented fruits. now that you've picked out your board, let's dive into the lineup. 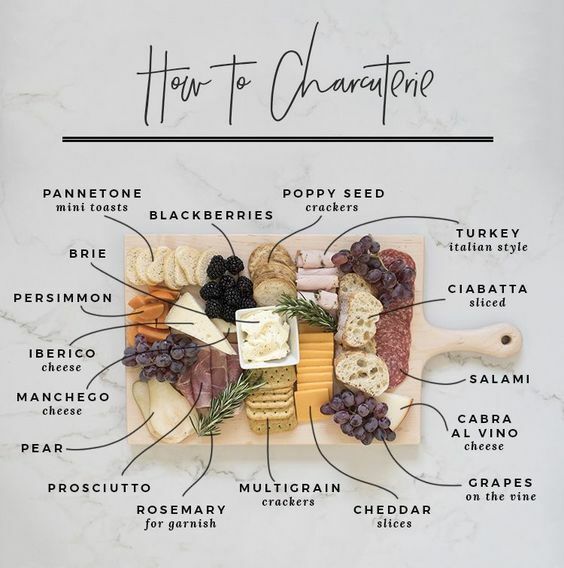 we found this extremely helpful little diagram on pinterest, which includes some of our favorite cheeses and meats, and thought you guys may find it handy too! you can always alternate based on your palette, but blending sharp, creamy, soft, and mild cheeses will hit the mark for a number of folks. when it comes to fruits, it's all based on the bounty the season provides. figs are definitely one of our favorites, so when those summer months roll in, those little guys automatically become a staple. not only are figs absolutely delicious and high in fiber along with a number of essential minerals like calcium and potassium, but they're drop dead gorgeous! we don't like to exclude anyone, so let's not forget blackberries, blueberries, raspberries, grapes and apples, all of which add a layer of color, dimension and sweetness to the palette, not to mention more raw vitamins and minerals. when it comes to spreads, we're pretty biased. we cannot live without truffle honey, simply put. we know once you try it, especially the magic our friends at Truffleist have created, we know you won't be able to make another charcuterie board without this rock star in the mix. also, be sure to include all natural spreadable jams like this and this, both by St. Dalfour, which pioneered spreads with zero added sugar. we keep this in a separate, smaller scale container to avoid getting jam on the cheese, meats, nuts etc. different folks, different strokes. at this stage, you're probably antsy to start talking carbs. we always love including a fresh baguette from our local bakery, Parisi, in our beloved astoria, new york. before company arrives, preheat your oven to 200 degrees, and place your baguette in there for 3-5 minutes right before cutting/serving. guests will definitely enjoy the warm bread coupled with a spreadable cheese. we also love Mary's gluten free gone crackers and Absolutely gluten free crackers (cracked pepper and onion are our fav's). the fillers are your layers of nuts and garnishes. we always include raw cashews, almonds and pistachios for a little extra crunch and added protein with healthy fats and oils. tell us your method of styling and selecting all the right ingredients for a balanced charcuterie spread! we always love to hear what your favorites are and any new recommendations you can make to help us improve our love of dairy, carbs and meats! Fresh Sage - Beautiful Garnish! Fresh Rosemary - Another stand out garnish to fill in the gaps.